A DOUBLE anniversary to record her 20 years as Chair of the Woking branch of Amnesty International – and 30 years as a member – is being celebrated by Woodham resident Ruth Breddal, who is also Chair of Amnesty International’s UK section. Ruth was elected to Amnesty’s UK board in 2013 and became UK Vice-Chair in 2015. The board then elected her to be UK Chair in May last year. With a background of volunteering in the health sector, she is committed to promoting human rights through local activism. She combines her work for Amnesty with her role as company secretary and director of a private business. 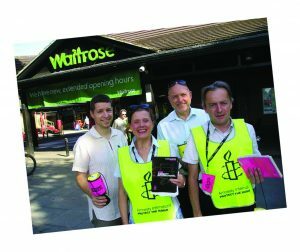 As the Woking branch of Amnesty gears up for it’s Christmas “Write for rights” campaign to get signatures on Christmas cards to individuals suffering injustice, Ruth spoke to the Woking News & Mail about her long standing involvement with the high profile organisation which tackles challenging issues. “I joined Amnesty around about the time my children arrived,” said Ruth. “Becoming a parent makes you see the world in a completely different light. I would tuck my kids into bed at night and marvel at my good fortune to live in a secure society where they could sleep safely and grow up in a world denied to so many living in fear of persecution in other countries”. “It was like shedding a skin and becoming a different person” said Ruth. “I wanted the security and safety that my own family enjoyed to be extended to others less able to protect themselves from injustice”. “Just wanting this and providing merely passive support for others was not enough,” she said. “I felt that I needed to actually get involved and take part myself in work that would produce real, positive and effective action. “There was no religious or philosophical driver, just a simple desire to stand up for the right and support those who suffer in the same cause. When you join Amnesty you are offered an opportunity to join a team working on a particular case to start with – one individual, somewhere in the world who is suffering injustice . . . . persecution . . . . . state tyranny,” she said. “Over the years I worked on many such cases, including those campaigns managed by the Woking branch, and eventually was appointed Chair of the branch,” she said. “Last year, the Woking branch, along with others, campaigned against child marriage in Burkina Faso, a poor African country and former French colony,” she said. “For many years the country had been under a dictatorship and had suffered from recurring droughts and military coups”. “The Woking branch was heavily involved from last December in a campaign against this practice,” said Ruth. “Amnesty International arranged over half a million letters and signatures protesting at the government’s inaction. Eventually, the regime took notice and is now moving to enforce prohibition of the practice”. Yet another success last year for a campaign worked on by the Woking branch was that of a woman in Mexico. “Her husband had been murdered and she had been arrested and falsely charged with the killing,” said Ruth. “In spite of there being no evidence against her, the police were convinced she was guilty. She was tortured for more than 15 hours to make a false confession by which she was convicted and imprisoned”. “This was one of the Woking branch’s “Write for Rights” 2016 Christmas campaigns,” said Ruth. “We are running another Write for Rights campaign this coming Christmas to support 12 current cases,” she said. “Those who wish to support us and sign cards can simply drop in at one of our monthly meetings held at 8pm on the first Monday of each month at Trinity Methodist Church in Brewery Road, Woking”.